University chancellor, Gwendolyn Point has dedicated her career to creating opportunities for students to learn and grow, particularly for Aboriginal students through leading and mentoring those in pursuit of higher education. 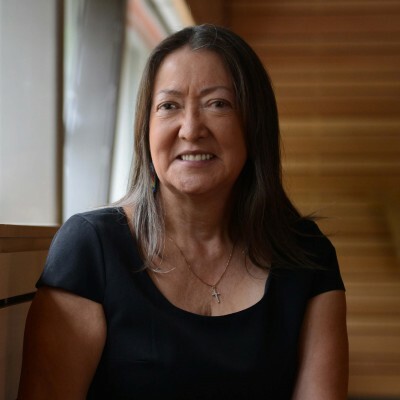 A member of the Skowkale First Nation, Point completed her Bachelor of Education in the Indigenous Teacher Education Program (NITEP) at the University of British Columbia in 1987. She followed her bachelor’s with a Master of Education, and is near completion of her doctorate. At various points in her career, Point taught at the elementary, secondary, and post-secondary levels, and held positions in leadership and administration. She worked as coordinator of First Nations education in her home town of Chilliwack, as regional coordinator of the Aboriginal services branch of the BC Ministry of Education, and as manager of the Stó:lō Nation Education Department, responsible for K-12, post-secondary, and First Nations language and culture programs. In 2005, Point was appointed assistant professor in the School of Social Work at the University of the Fraser Valley, where she taught First Nations Studies. She was dedicated to creating space in the classroom for Aboriginal students. When she started teaching at the post-secondary level in 1990, there were only two Aboriginal students in her class; in 2014, there were 26. She resigned from her teaching post in late 2014 to accept the position of university chancellor. Throughout her career, Point has been recognized with numerous honours. She was given the Ambassador Award from Aboriginal Tourism BC; recognized as Honorary Witness by the Truth and Reconciliation Commission of Canada; and lent her name to two bursaries through the Chilliwack School District, in addition to receiving a number of community awards for her contributions to Stó:lō language and cultural education.